Hill's Prescription Diet s/d Canine has been formulated by veterinarians to help resolve struvite crystals and stones in your dog. Struvite forms as a result of urine that's saturated with protein, calcium, phosphorus and magnesium combined with an improper urine pH. Reduced magnesium, phosphorus and protein - decreases urinary concentration of struvite constituents, magnesium, ammonium and phosphate. Increased energy - reduces food intake and thereby mineral intake. Increased sodium - increases urine volume to decrease urinary concentration of struvite-forming constituents. Acid pH 5.9-6.3 - increase the solubility of struvite crystals. Maize starch, animal fat, dried whole egg, pork liver, sucrose, cellulose, iodised salt, vegetable oil, potassium chloride, calcium carbonate, DL-methionine, taurine, vitamins and trace elements. 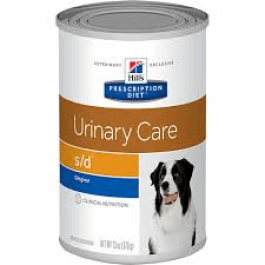 Hill's Prescription Diet s/d Canine should be recommended by your veterinary surgeon. For detailed information on feeding amounts and how this food can help your pet, please consult your veterinary surgeon. Exclusively feed the recommended Prescription Diet food and keep fresh water availalbe at all times. These ranges are a starting point only because dogs' needs vary. Adjust the feeding amount to maintain the optimal body weight. 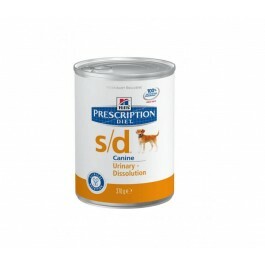 Prescription Diet s/d Canine is not recommended for long-term maintenance feeding. The transition to feeding s/d Canine should ideally take a period of 7 days. After successful dissolution (or surgical removal) of struvite uroliths feed Prescription Diet c/d Canine (or Prescription Diet w/d Canine if prone to being overweight) long term to reduce the recurrence of struvite urolithiasis. To control non-struvite uroliths feed Prescription Diet u/d Canine.